Some of us are old enough to have been captivated by the exploits of the crew of the starship Enterprise when they first aired Star Trek in the 1960s. The rest of you will have seen the any number of the syndicated re-runs that still air today. In that first airing of 'Balance of Terror', the crew of the Enterprise had their first encounter with a Bird of Prey commanded by Sarek of Vulcan's Romulan twin. The devastating power of that plasma torpedo kept all of us on the edge of our seats while the crews of the Enterprise and Bird of Prey played out a similar cat and mouse game reminiscent of allied destroyers hunting U-boats in World War II. You might remember the 1/650 scale kit produced by AMT and Round 2 models reissued this kit after a long absence back in 2011. When that kit was reissued, it was subjected to greater scrutiny since details of the original studio model were available. 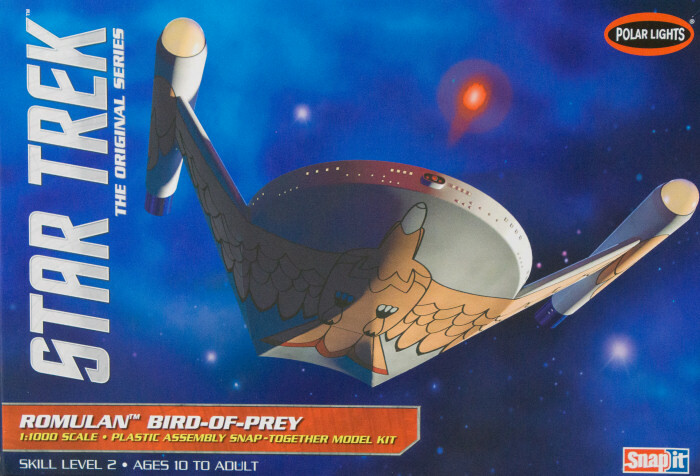 Here is Polar Lights (another Round 2 Models brand) new 1/1000 kit of the Bird of Prey and they did not scale down the AMT kit. In this release, they've captured the details of the studio model from the larger engine nacelles to the stepped edges of the upper hull. This is a nice kit! Molded in white styrene, this kit is presented on three parts trees plus Round 2's excellent black styrene dome and steel rod display stand and one small tree of clear parts for the engine nacelle domes. The instructions sum this model up nicely: Step One - snap the model together. The decal sheet captures the bold bird image on the ventral hull as well as the details that carry up onto the dorsal side. The decals also provide viewing ports as well. This is a nice model that will be a quick build and nice display which will take any Trekkie back to that epic episode when the Enterprise came face-to-face with the unknown. For a look at this model built-up, look here.